In case you’re wondering why there haven’t been any posts on this site for the past few days while Yao and the Rockets have played two games in China (they won their second game just a few minutes ago), I have been in The Phillipines on a business trip. I’ve been so busy working, I haven’t had much time to write about the Rockets’ two games in China. But I have been able to watch most of them at a Chili’s on this country’s “Basketball TV” before crashing at the hotel after long days working. I’m flying back to the U.S. in a few hours (just like the Rockets), so I gotta get out of this Chili’s and get some sleep before my flight…and I probably won’t be back online for another day or two. In the meantime, you can check out in the forum Raymond’s coverage of the last two games right here. Before going dark for a couple of days, I can tell you even though I have missed analyzing in depth the Rockets’ games in China, Filipinos know their NBA, just like in the States. I’ve been impressed, and it has helped fill my basketball fix while away. The boot on Yao’s foot is the an Ankle Wrap from Game Ready, which conveniently and simultaneously delivers intermittent compression and adjustable cold therapy to Big Yao’s left foot. Click here to see many more photos of Yao and the Rockets on the plane and exiting the airport. There will be plenty more coverage in this forum of the Rockets’ activities in China for this week’s preseason games against the New Jersey Nets, thanks to Raymond as always. 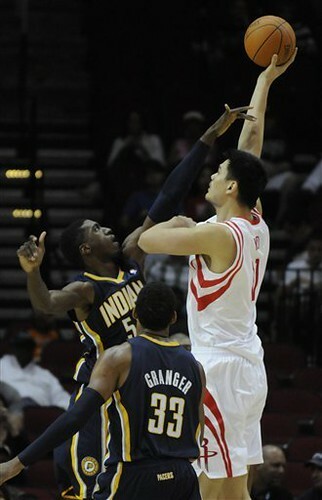 Yao looked alot like his old self in only his third preseason game since his comeback started on the court. Playing Saturday night against the Indiana Pacers, Yao in his 12 minutes scored 10 points on 4-of-5 shooting, 4 rebounds, and 2 blocks, his best outing thus far this preseason. You can see video highlights here on NBA.com. A dunk from Yao as well as a nice jump hook start around the 1:20 mark, and the Chase Budinger one-handed alley-oop throwdown at the end of the clip is absolutely SICK! Chuck Hayes finished a sweet alley-oop of his own after starting a break with a steal. I could go on-and-on. Watching all of these highlights makes you think the Rockets are going to be something special this year. I know it’s only the preseason, but Indiana’s defense was pretty good last season. Since my time is limited here at my hotel here in The Philippines (my Internet is about to run out and I have to checkout of the hotel now), I’ll refer you to the Chronicle’s story about the game, which is excellent. I’ve been out of the country this whole week, so I have missed the first two Rockets preseason games. Well, actually, I tried to watch Thursday’s game against the Spurs using my Slingbox, but the video was so choppy being on the other side of the world, I had to give it up. However, I’ve scoured the Net and read that Yao did okay. In a 90-87 Rockets win, he played 12 minutes and 48 seconds, going 2-for-8 from the field for 5 points, both on layups and pick-and-rolls with Aaron Brooks. He also grabbed 7 boards and blocked 3 shots. He also had two turnovers, which is to be expected after the long layoff from game action. Click here for more photos from the game, including photos that Raymond posted of Yao going up against Rockets rookie Patrick Patterson in pre-game. Encouraging was the progress of Yao’s backup Jordan Hill, (at least while Brad Miller is out with a sprained ankle). Here’s what Rick Adelman had to say after Tuesday’s game in which he scored 16 points, a career high with the Rockets, on 6-of-9 shooting, 3 rebounds, but 5 turnovers. The Rockets play a back-to-back this weekend. Yao will play the first game, sit out the next game, then immediately after the game they will leave for China to play two games against New Jersey. I can only imagine how tired they will be after getting off a 14-hour flight (maybe longer) right after playing a pre-season game. It’s all part of the glamor of playing on one of China’s favorite NBA teams. Raymond sent me a link to this story on Rockets.com quoting Yao and Shaq about how unfair officiating has been against them simply because they are big guys. They also talk about how much they respect each other’s game leading into tonight’s matchup between the Rockets and Suns. Also, here’s a video of Shaq being interviewed about the same topic(s). Yao Ming scored 17 points, grabbed 7 boards and had 2 blocks in Sacramento Thursday night as the Rockets easily beat the Kings 110-97. Yao slightly pulled his groin in the first quarter and went to the locker room for treatment, but managed to play 32 minutes total and rested during the entire fourth quarter. Hopefully he’s okay — he must be if coach Rick Adelman played him that long. Click here for more photos from the game. Ron Artest was the Rockets’ high scorer with 19 points in his first game back at ARCO Arena since being traded in the off-season. He also had 3 rebounds, 4 assists, and 2 steals. You can probably tell I don’t get that fired up about preseason games, so I’m glad it’s finally over. The Rockets now have several days off before next Wednesday night’s season opener against Memphis. 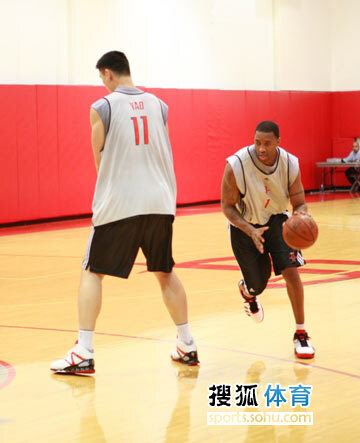 Raymond has posted photos of Steve Francis and Tracy McGrady back at practice. Tuesday was McGrady’s third day in a row back at practice without any pain, and Francis’ first. Click here for more photos from the practice that Raymond has posted in the forum. After sitting out Wednesday’s game against Memphis, Yao Ming was back in the lineup Friday night against Sacramento. 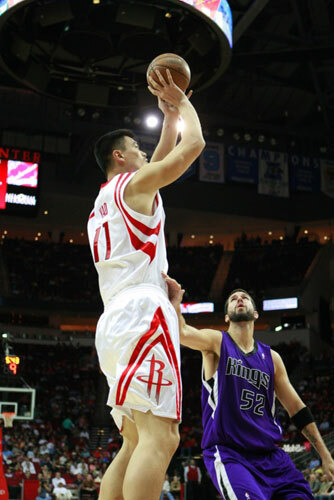 Yao scored 15 points in 26 minutes, hitting 7-of-11 from the floor. But shockingly, he only made 1-of-5 free throws. He left the game in the fourth quarter after tweaking his ankle, but he’ll be fine. Meanwhile, Ron Artest played well against his former team, scoring 13 points on 5-of-7 shooting. He also had 3 steals and two assists. Aaron Brooks had a fantastic game, scoring 23 points since he got more minutes (42) than normal because Tracy McGrady sat out to rest his sore right knee. Brooks made 7-of-16 field goals, including 4-of-8 from 3-point land. Click here for more photos from the Rockets’ pre-game shootaround as well as the game. Click here for game coverage from the Houston Chronicle. Yao was held out of a meaningless game against the Grizzlies Wednesday night in Memphis. The Rockets seem to be sticking to their guns about managing Yao’s time wisely to avoid unnecessary wear-and-tear. After all, this was the Rockets third preseason road game in a row within a 5-day period. Turns out they didn’t need him after beating the Grizzlies 101-97. Click here for the Chronicle story on the game, including some commentary on the Rockets’ decision to try to make up for not having the height of Dikembe Mutombo in the lineup using the quickness of their power forwards. 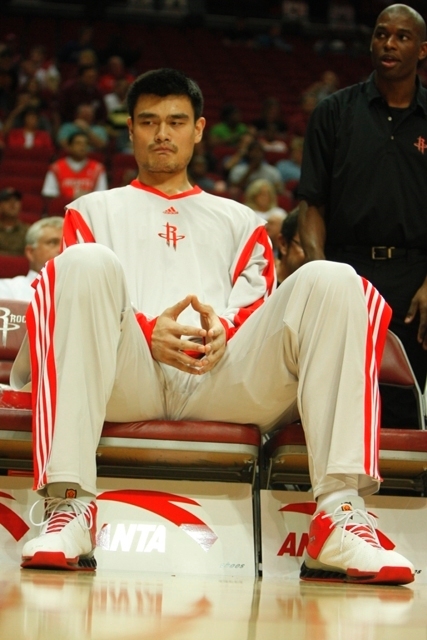 Click here for Raymond’s photos from Yao’s pre-game shootaround. The Rockets lost their second preseason game in a row, this time in Oklahoma City where they lost to the Seattle Sonics….er, I mean the Thunder (that’s going to take me a few weeks to get used to that), by blowing another 4th quarter lead to fall 110-104. Click here for the Houston Chronicle’s game story. You are currently browsing the archives for the NBA preseason category.